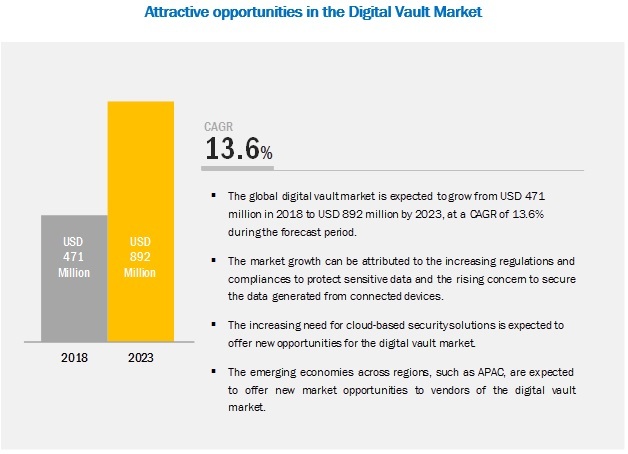 [114 Pages Report] The global digital vault market size is expected to grow approximately from USD 471 million in 2018 to USD 892 million by 2023, at a Compound Annual Growth Rate (CAGR) of 13.6% during 2018–2023. Major growth factors for the market include increasing regulations and compliances to protect sensitive data, and rising concerns for protecting data from connected devices. The BFSI industry vertical is a major adopter of digital vault solutions due to the highly sensitive financial data. The vertical faces various challenges related to stringent regulatory and security requirements, providing superior service to customers, and others. In addition, the vertical is always on the lookout for security products and services that could protect its employees, customers, assets, offices, branches, and operations. Hence, it holds a significant share in the overall digital vault market. The vertical introduces new and improved financial products and services to enhance their business operations, which makes it attractive for frauds to target sensitive customer information. Consulting services provide a set of services based on the service providers product portfolio as well as third-party product offerings. Typical consulting services include advices, in-depth product description, planning of solution implementation, architecture design, and post-production support. Consulting services help organizations to understand the need and implementation of solutions. It also provides a robust model of solutions to help clients achieve their strategic goals. These services ensure increased realization of benefits and proactive risk management, and better alignment of program objectives and business goals in large-scale transformation programs. North America is the leading region in the digital vault market. The region has developed economies (the US and Canada), which give it an upper hand over other regions in terms of utilization of highly secured platform for storing data gathered from vital sources. The region is expected to provide immense growth opportunities for digital vault vendors, due to the increasing demand for secured repository for long-term storage of critical information. The financial sector needs to be preventive than responsive for securing the information related to customers and enterprises. Banks and financial institutions are indulged in continuous business operations in which important documents need to be stored. The US and Canada are at the forefront as these countries have sustainable and well-established economies, which empower them to strongly invest in R&D activities, thereby contributing to the development of innovative technologies. IBM is one of the leading providers of IT solutions with its innovative and wide range of technology products, which meet the changing paradigm of businesses. IBM offers EVault solution, enriched with advanced features, such as multivaulting capabilities, web-based User Interface (UI), scheduled backups, plug-in software support, end-to-end encryption, system image and granular recovery, deltaPro deduplication, and intelligent compression. The solution is capable of multivaulting, by which a client or server can be connected to multiple EVault locations. With this capability, data security is ensured, as it is stored in more than one location. IBM focuses high on the acquisition strategy for growing its business in the digital vault market. For instance, in January 2017, the company acquired Agile 3 Solutions, a provider of a cybersecurity solution that helps uncover, analyze, and visualize data-related business risks. Johnson Controls is one of the leading providers of digital vault solutions. The company’s Digital Vault solution collects and stores data securely from different sources. The solution enhances cybersecurity by encrypting data at rest and in transit. The access control system protects the data by enabling access of data to only authorized entities. Data stored in the Digital Vault is masked, which prevents the security breach of any PII. Johnson Controls' Digital Vault improves data security by monitoring and identifying potential data breach. The solution eases the data mining process and serves as a medium of communication among various building subsystems and devices. Earlier, the data gathering process involved human efforts, which used to take a long duration. With the automation achieved through Johnson Controls’ Digital Vault, this process has become easier and quicker. In June 2018, CyberArk announced the availability of CyberArk Privilege Cloud, which provides privileged access security as a service offering. In January 2017, IBM acquired Agile 3 Solutions, a provider of the software used to visualize, understand, and manage risks associated with the protection of sensitive data. In March 2018, Oracle acquired Zenedge, a provider of cloud-based application and network solutions to protect enterprises from complex digital threats. In October 2018, Keeper Security launched BreachWatch, which monitors the internet and web for breached accounts by matching records stored within Keeper Vault. What are the upcoming industry applications for the digital vault market? Which are the major factors expected to drive the market in near future? Which region would offer a higher growth for the vendors in the market? Which service would account for the highest market share in the market? The study involved 4 major steps that helped estimate the current market size of the digital vault market. Exhaustive secondary research was done to collect information about the parent market and peer markets. The next step was to validate these findings, assumptions, and sizing with industry experts across the value chain through primary research. Both top-down and bottom-up approaches were employed for estimating the complete market size. Thereafter, market breakdown and data triangulation methods were used for estimating the market size of segments and subsegments. In the secondary research process, various secondary sources such as D&B Hoovers, Bloomberg BusinessWeek, and Factiva have been referred to for identifying and collecting information for this study. Secondary sources included annual reports; press releases and investor presentations of companies; white papers; technology journals and certified publications; and articles from recognized authors, directories, and databases. The digital vault market’s expenditure across regions and its geographic split in various segments have been considered to arrive at the overall market size. After arriving at the overall market size using the market size estimation processes as explained above the market was split into several segments and subsegments. To complete the overall market engineering process and arrive at the exact statistics of each market segment and subsegment, data triangulation methods and market breakup procedures were employed, wherever applicable. The data was triangulated by studying various factors and trends from both the demand and supply sides in all industry verticals. Johnson Controls (Ireland), CyberArk (US), IBM (US), Oracle (US), Keeper Security (US), and 20 other players. This research report categorizes the digital vault market based on component (solutions and services), services, organization size, industry, and regions.